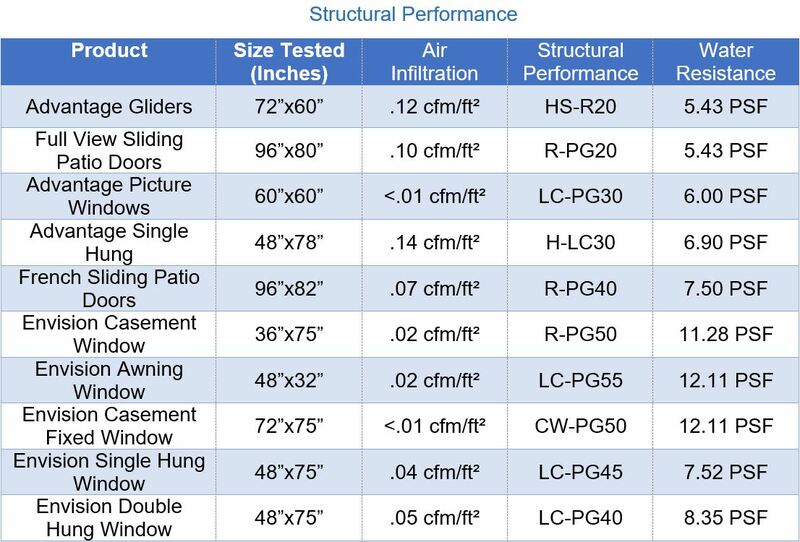 All Vector products meet or exceed the published results shown below for structural strength, water resistance and air infiltration. Furthermore, all Vector windows and doors are tested and certified for thermal performance by National Fenestration Rating Council (NFRC). Quality and performance are assured through testing and plant inspections by this agency. Due to continued ongoing product testing, the information provided can be changed by Vector at any time without notification. These data supersede any previous data published by Vector. *Additional reinforcement needed to obtain rating. Additional charges may apply.AirInfiltration: ASTM E283-91 cubic feet per minute of air leakage per square footage of window or door. Water Resistance: ASTM E547-96 no water leakage over the sill at the pressure shown; with four cycles of water, five minutes in duration. Structural Performance: ASTM E330 pressure shown applied positive and negative to unit and held for 10 seconds, with no damage allowed. Forced Entry Resistance: CMBSO ⁄ CAWM 301-90 for windows, CMBSO ⁄ CAWM 300-98 for patio doors.